The mission of TREPAC is to raise and disburse funds to promote home ownership, protect real-property rights, and increase political awareness. If real estate is your profession, politics is your business. And no one protects the real estate industry and your bottom line like the Texas Association of REALTORS® Political Action Committee (TREPAC). TREPAC backs local, state, and national candidates and elected officials who have a proven track record of protecting private-property rights, preserving the dream of home ownership and supporting the vitality of the real estate industry. You can find a comprehensive list of recent victories by clicking HERE (you will have to log in to TREPAC.com with your TAR login to view). 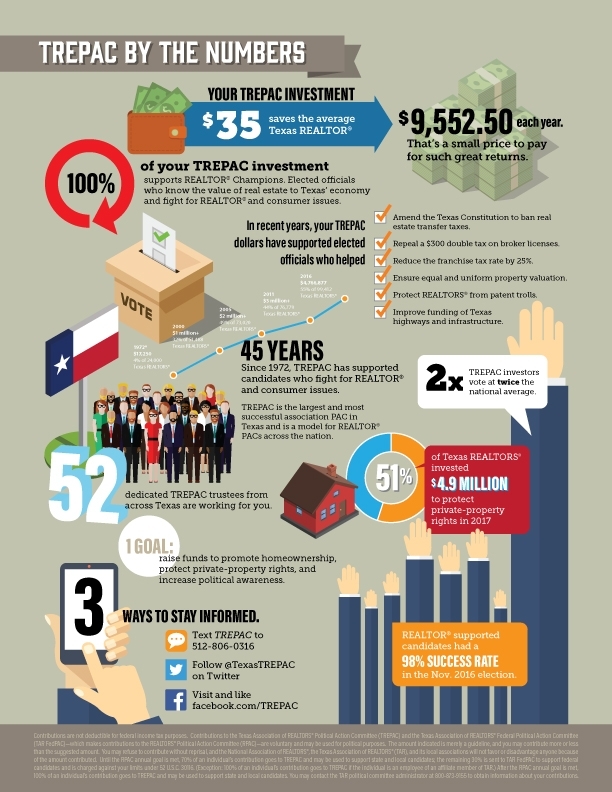 TREPAC is a voluntary, nonprofit organization that supports candidates for federal, state, and local office who demonstrate their support for private-property rights and the real estate profession. We would like to thank all the TREPAC investors for your past and continued participation. A Texas REALTOR® investing $110 to $249 will receive a 110 Club certificate. A Texas REALTOR® investing $250 to $499 in one year becomes a Lone Star Statesman. They will receive a Lone Star Statesman lapel pin for each year. A Texas REALTOR® investing $500 to $999 in one year becomes a Capitol Club member. The member will receive special recognition that is selected on a yearly basis. A Texas REALTOR® investing $1,000 in one year will be recognized as a Sterling R major investor and will receive a Sterling R lapel pin and a TREPAC jacket. Every year that you are recognized as a Sterling R major investor you receive a new major investor lapel pin and TREPAC jacket. A Texas REALTOR® investing $2,500 in one year will be recognized as a Crystal R major investor and will receive a Crystal R lapel pin and a TREPAC jacket. Members can then sustain their Crystal R status with an annual investment of $1,500. Every year that you are recognized as a Crystal R major investor you receive a new major investor lapel pin and TREPAC jacket. A Texas REALTOR® investing $5,000 in one year will be recognized as a Golden R major investor and will receive a Golden R lapel pin and a TREPAC jacket. Members can then sustain their Golden R status with an annual investment of $2,000. Every year that you are recognized as a Golden R major investor you receive a new major investor lapel pin and TREPAC jacket. If a member became a Golden R in 2001 or before, they can sustain their Golden R membership with an annual investment of $1,000. A Texas REALTOR® investing $10,000 in one year will be recognized as a Platinum R major investor and will receive a Platinum R lapel pin and a TREPAC jacket. Members can then sustain their Platinum R status with an annual investment of $5,000. Every year that you are recognized as a Platinum R major investor you receive a new major investor lapel pin and TREPAC jacket. RPAC’s Major Investor Program consists of an elite and passionate group of REALTOR® investors who give a minimum annual investment of $1,000. Each first-time RPAC Major Investor will receive a crystal plaque to commemorate their inaugural investment. The four levels within the RPAC Recognition Program are described below. RPAC Hall of Fame is awarded to members who have invested more than $25,000 throughout their career. This is a lifetime award achievement.